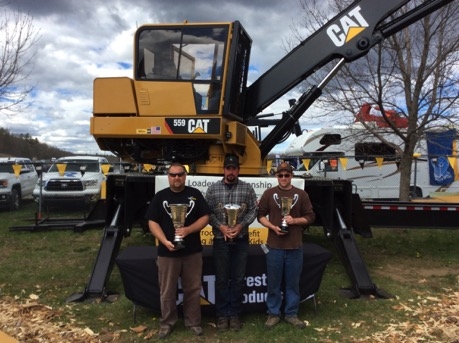 May 16, 2016 - A Maine logger has won the Caterpillar Loader Championship contest at the Northeastern Forest Products Equipment Expo. The contest, held in connection with the Northeastern Expo from May 6 to 7 in Essex Junction, Vt. raised $2,227 for Log-A-Load for Kids, an organization sponsored by loggers and others in the forest products industry to benefit hospitals associated with the Children’s Miracle Network. The funds include voluntary contestant donations, a matching contribution from Caterpillar, and merchandise sales. Shaun McLucas of Rangeley, Maine, won the contest with a winning time of 2 minutes and 9 seconds. Marc Riendeau of Danville, Vt. won second place with a time of 2 minutes and 14 seconds, and Ben Hardwick of Francestown, N.H., won third place with a time of 2 minutes and 17 seconds. Rounding out the top five were Derrick Berry of West Burke, Vt., fourth place, and Gerard Riendeau of Lyndonville, Vt., fifth place. The top three winners receive a trophy, jacket and cash prizes, and winners for fourth place and fifth place receive a jacket. The Caterpillar Loader Championship drew 109 participants over the two-day exposition. Contestants demonstrate their skill with a Cat knuckleboom log loader by picking up and moving blocks between two checkerboards. Loggers with the fastest times are the winners. The contest was first introduced as the Prentice Loader Championship at the sawmill and logging show in Richmond in 1972. Caterpillar Forest Products is a leading manufacturer and worldwide marketer of timber harvesting, millyard, road-building and land management equipment. Products are marketed under the Cat, Prentice and CTR brand names through a global independent dealer network.